Are you a new business or a small business? Do you want to offer your customers the best possible experience, without breaking the bank on merchant services? Are you looking for a solution that allows you to peddle your ways in the physical or digital space; increase trust and loyalty with fast, secure methods; and process payments quickly and securely, so you can go back to the important tasks that running your business demands? We thought so. That’s where we come in. 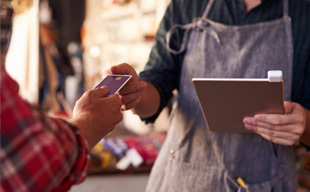 As a premier provider of merchant services, Merchant Tree helps ensure your customers will have an excellent experience and you will continue to build relationship with them over the long run. The options you offer to your customers make a huge difference in how likely they are to bring you their business again, while the simplicity and cost-effectiveness of your operations directly impacts your growth and success in future. We enable you to accept payments from all of your customers, regardless of where they’re located. The credit card terminals we provide accept funds in more than a hundred currencies and from almost every payment method in the world. This translates to the highest possible level of convenience for you and your customers both, improving your relationships, your branding and your success. That’s not all. As a business owner, you know it’s not enough simply to take payments from your customers. You must also have faith in your ability to keep data secure and generate reports exactly when you need them. You need to be able to take gift cards, loyalty cards and mobile payments in real time, even in the midst of a crush of customers. And you naturally want to be able to integrate with the full suite of marketing programs available to small business owners today. We’ve built strong, reliable and long-lasting relationships with payment processors in the United States as well as abroad. The relationships allow us to furnish you with robust and cost-effective merchant services, integrating smoothly with POS systems and meeting the needs of your specific business model. Such efficiency with merchant services enables you to provide the experience your customers need to do business with you again and again. If you’d like to learn more about merchant accounts from Merchant Tree, we invite you to get in touch today. We’ll provide you with unparalleled tools matched to your business’s unique needs, so you can experience greater success and satisfaction in your business right away. Please give us a call at (800) 610-3922 or contact us today!